Loggia Lanzi (Loggia dei Lanzi) is one of the most prominent buildings on Piazza della Signoria in Florence. It is one of the attractions of the city. The building was constructed in the period from 1376 to 1382 years. It is a shed with no exterior walls. The building was intended for meetings, receptions, other official events of the Florentine republic. 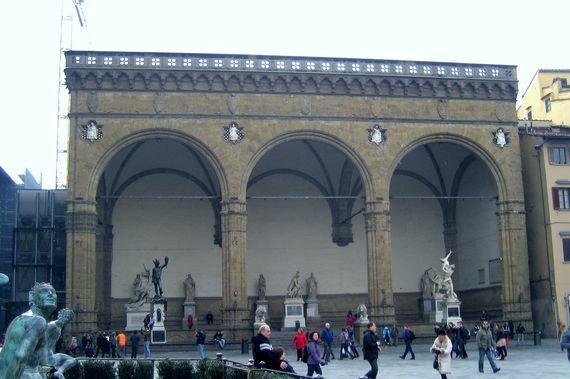 Next to the Loggia Lanzi building is the entrance to the famous Ufitsi gallery and Palazzo Vecchio. At present, there is an exhibition of sculptures from the collection of the Uffizi Gallery in the Loggia Lanzi. Also Fountain of Neptune is locatet on the Piazza della Signoria (see the photo). The photo was taken during a tourist trip to Italy in February 2013.